(CNS): Although police management had revealed that fifteen people were offered places on the new police training course following last year’s major local recruitment campaign, when class started last week it appears only thirteen people showed up. In a short press release from Government Information Services revealing the names of the new recruits, officials said 13 were present for the induction class welcomed by Deputy Commissioner Anthony Ennis at the RCIPS Training and Development Unit in Governor’s Square last Wednesday. The police announced less than two weeks ago that after receiving some 500 applications last year following a rigorous process, they had whittled that number down to fifteen men and women who would start training this month. From the ten men and five women who had been selected to begin the training programme, none were recruited from overseas. Twelve were Caymanians and three permanent residents, but it is not clear who did not show up. The RCIPS officials said the group is the most localised set of recruits to join the police for some thirty years. 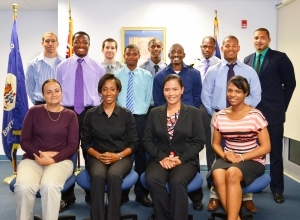 Gregory Banks Jr, Sarah Joy Bodden, Kishna Burke, Christopher Davies, Kadane Romane Hall, Craig-Anthony S. Jervis, Zachary Marc McLaughlin, Kristoff Powell, Andre Savoury, Patricia Sevik, Andrae Strachan, Maxwell Thomas andNassaria Thompson will join the service this morning when their formal training begins. It's not a matter of the two recruits "not showing up" and wasting anyone's time. The RCIPS press state "two did not show" which is very wrong. The two recruits would've very well showed up, if the RCIPS actually their jobs. There was a claim that the their will be rigorous background checks on all the potential recruits, but somewhere along the line they missed important details. The two recruits were asked to WITHDRAW from the training, due to a fault with the RCIPS. But as they say, ONLY IN THE CAYMAN ISLANDS. If they had a proper training programme, less than half would make it through the academy. Instead, they let anyone in that can pass a background check. Let's start by hiring some officers that know how to read and write and then maybe we can get some officers that will succeed and create a better organisation. Regardless of their status, it would be nice to have some competency. Why not ask the RCIPS officials who are the ones missing and why they are missing? CNS, I think you should get an FOI request on the names of the initial 15, the results of their tests, the acceptance letter they all received and finally, find out why a young permanent resident who was initially offered a position was later rejected after going through the rigourous process. A young permanent resident who made all preparations to start training he was invited to. No one will argue that Cayman should not look after Caymanians first, but for heaven's sake, why would you want to play with a young person's future like that? If the positions were only for Caymanians then that should have been made clear from the outset and no Permanent Resident should have progressed further in the screening, especially if you have enough capable and qualified Caymanians. The decision to drop a Resident who was offered a position after all that rigourous screening is callous. It is immoral. Why? Because someone complained? CNS, this is a big story! Get the info! It is unfortunate that our freedom to speak is non-existent and hence I have to remain anonymous. Lord, we need you now more than ever! If that is true, they'll be looking at a lawsuit. If you look at this another way it is an 86.66% attendance rate. Not bad. Better than the state schools! Why should it matter that 2 of the candidates dropped out? The RCIPS isn't for everyone. It's a difficult job and it's best that those candidates realize that now than later when they're way in over their heads. It's their prerogative, not for us to question. Probably because the Police are now down two people, those jobs could have been offered to the next in line. The time to realise that it's not for you is before you apply, not after you've wasted everyone's time. Act sensibly. Call, write and let the RCIP training officer know that you have had a second thought about the job or you was unable to attend the classes. wish the police would do that. only it wouldn’t just be called manners. it would be them actually doing their job. This negative publicity is probably first sign of embarrassing the only 'native' Caymanians and lead to constructive dismissal, perhaps to get the 3 Jamaicans that missed this group? Why are they missing? WHy embarrass people liek this if the reasons are not known? Go get and education! Dunce! Why is RCIPS still renting this office? Surely they could operate from somewhere within the grand palace on Elgin Avenue and do their little parades behind the old Glass House. That's a good start. Why not identify the no shows – would this cause further embarassnment?. Two of them have been recruited for undercover duty and their first task was to attend class without the other 13 noticing that they were present. They are off to a good start I would say. One of them is disguised as a flag. I hear they went looking for the missing police surveillance van…. Do you know why they were missing? Excellent question! I know why they are missing! Because they are Premanent Residents and someone complained that their positions should be given to a Caymanian. So the officials dropped them after they showed up for the start of their training on the invitation of the same officials. The same officials who reviewed their applications and knew that they are residents. The same officials who advertised that the positions are opened to Caymanians and Residents only. The same officials who scrutinized 500 applicants, narrowed down to 21 then the best 15 and knew all this time that these 2 are residents. What changed between showing up for the first day of training and the photo shoot for the news article? So why would they keep one permanent resident and not the two? People need to quit specultating and creating rumors. Oh, that's the other question! Quite interesting. When you get the answer, let me know. And believe me, this is absolutely no speculation. Just wait, the truth will be revealed!